Student fees and finance for where you live - Which? Get your head around student finance with our breakdown below. We've listed tuition fee costs, student loans and financial support wherever you are in the UK. Can I apply for student finance after the deadline? Popular student finance questions… answered! Confused about student finance? 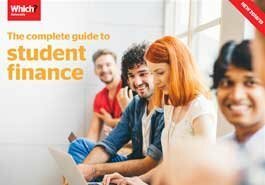 ​Grab our free guide to student finance. If you're from England: up to £9,250 per year when studying in England, Scotland or Northern Ireland; up to £9,000 in Wales. If you're from Scotland: free if you're studying in Scotland (see more below); up to £9,250 per year in England or Northern Ireland; up to £9,000 in Wales. If you're from Wales: up to £9,000 per year if you're studying in Wales; up to £9,250 in England, Scotland and Northern Ireland. If you're from Northern Ireland: up to £4,160 per year if you're studying in Northern Ireland; up to £9,250 in England or Scotland; up to £9,000 in Wales. Bear in mind that sandwich or work placement fees will differ. We cover this below. For universities in England, tuition fees are linked with Teaching Excellence Framework (TEF) ratings. Only those universities awarded a gold, silver or bronze TEF rating can increase their fees above £9,000 to £9,250 per year, in line with inflation. For university providers in Northern Ireland, Scotland and Wales, participation in the TEF is voluntary and has no impact on tuition fees. What do student loans cover? How much can I get? You can apply for a combination of student loans and grants to cover all or go towards your tuition fees and living costs at university. Figures shown below are the maximum amounts available, based on what information has been published for the 2019/20 academic year. The actual amount you receive will depend on where you're studying, your course fees and household income. As a rough guide, 68% of students we spoke to told us that they have both a tuition fee and maintenance loan*. It’s always best to apply for student finance as soon as you can. You don’t have to have a confirmed place before you apply. What you can get depends on your individual circumstances and whether or not you provide information about your household income when applying (what's referred to as 'means-tested' finance). Beyond sorting out your student finance, here are six other ways to get money-ready for uni. A Tuition Fee Loan worth up to a maximum of £9,250 per year is available to cover fees each year and is directly paid to your university. The second element of your student finance package is the Maintenance Loan, to help with living costs if your household income falls below a certain amount. If you'll be living away from home (outside London) while studying, a maximum of £8,944 per year is available. This increases to £11,672 if you'll studying in London. What you can get depends on your individual circumstances. So it's important your parents provide the necessary, correct information, documents and evidence to support your finance application. The deadline to secure your student finance if you're beginning a course in September 2019 is 24 May 2019. Read our full guide to student finance in England. If you're Scottish and go to a Scottish university, you won't pay anything in tuition fees (but you still need to meet certain residential criteria and apply officially through the Student Awards Agency Scotland). If you're studying in either England, Wales or Northern Ireland, a Tuition Fee Loan is available to cover these upfront. To help cover your living costs, a (repayable) Maintenance Loan is available of up to £5,750 per year, depending on your household income. If you're under 25, you can apply for an additional, (non-repayable) Young Students' Bursary worth up to £1,875 if your household income is under £18,999. Alternatively, you may qualify as an Independent Student and be eligible for a similar combination of a loan and bursary, depending on your household income. The Student Awards Agency Scotland (SAAS) warn that if they don't receive your application before the 30 June 2019, they might not be able to process this in time for the start of your course. Read our full guide to student finance in Scotland. Welsh universities can charge Welsh students up to £9,000 a year in tuition fees. You can apply for a Tuition Fee Loan to cover these. For living costs, most Welsh students will be entitled to a Maintenance Grant worth £1,000, regardless of household income. Higher grants are available for students from lower-income households, with a repayable Maintenance Loan available to make up the rest. Overall, you'll be entitled to a combination of grants and loans worth up to £7,840 if you're living at home with your parents; up to £9,225 if you're living away from home but studying outside of London; and £11,530 if you're studying away from home in London. The finance deadline to guarantee student finance in time for the start of term is 7 May 2019. Read our full guide to student finance in Wales. If you're from Northern Ireland and staying there to study, you'll pay a maximum of £4,160 per year in tuition fees, or up to £9,250 per year if you're studying in England or Scotland, or £9,000 in Wales. In any case, you can apply for a Tuition Fee Loan to cover the full amount payable. A Maintenance Loan is available to help cover living expenses. You can get up to £4,840 if you're living away from home outside of London, increasing to £6,780 if you're living in London. You can get a bit more if your course lasts 30+ weeks. There are also non-repayable grants which you can apply for based on personal circumstances, although there are restrictions depending on which you apply for. There is a Maintenance Grant if your household income is below £41,065, with a full grant of £3,475 available for households earning below a certain amount. Read our full guide to student finance in Northern Ireland. The deadlines given above are in place to ensure you have finance for the start of term. However, you can apply for student finance nine months after the start of the academic year. A sandwich course is a three, four or five-year undergraduate course with time spent on placement, usually in industry or business. You’ll usually get either a tuition fee waiver (so you don’t pay any tuition fees at all) or a reduction in tuition fees for the time you’re on placement. You might even get paid, although employers aren’t legally obligated to pay you. Contact your uni to find out its set-up with sandwich courses, and whether it would be the right decision for you. Popular student finance questions … answered! Can student loans be used for anything? Your tuition fee loan will go straight to your university, so you won’t even see it. You can forget about this for now (until it comes time to repay it). If you’re eligible for and receive a Maintenance Loan, this will go into your bank account at the start of each term. So in theory, yes you can spend it on anything you like. It’s effectively your money (albeit money that you need to pay back in the future, with interest). It’s more about what you should spend whatever Maintenance Loan you receive on. Don’t rush to the shops the moment it goes in because you’re suddenly ‘rich’. Remember that it has to last you the whole term, until your next instalment (roughly 12 weeks later). Figure out how much you’ll need to live on in a single term – our student budget calculator can help with this. Then, once you know how much you’ll receive in student finance, see how much extra you’ll need to cover all your outgoings. Find out the best student bank accounts (as voted for by students) and get advice on how to clear your student overdraft debt on Which? Money. Can I use my student loan to pay rent? Yes, and accommodation is probably the number one living cost that should go top of your list of outgoings. You need a roof over your head, after all. For a lot of students, their Maintenance Loan won’t even cover the price of accommodation – housing can be pricey, especially depending on where you’re studying in the UK. This is where browsing the full range of housing options available to you, and considering what you absolutely must have, can help shave some money off what you spend. For example, do you need really uni halls with a state-of-the-art gym? Read our tips to picking the right student accommodation. It’s crucial to start with the essentials (ie housing, transport, food, course materials) so these are accounted for. Download our free student budget planner. Can I use my student loan to pay off my credit cards? If you’re bleeding money from interest on what you borrow, it might make sense to pay this off sooner rather than later. Credit cards can be useful when wielded properly such as making a large one-off purchase when you don’t have the money just yet (but will). BUT, we’d recommend looking to your interest-free overdraft ahead of credit cards, as you won’t pay interest on what you borrow up to a certain amount on these. Read more about using credit cards wisely in our student banking guide. * Data source: Which? University Student Survey 2018, surveying 5,000 undergraduate students at UK universities between March and April 2018.